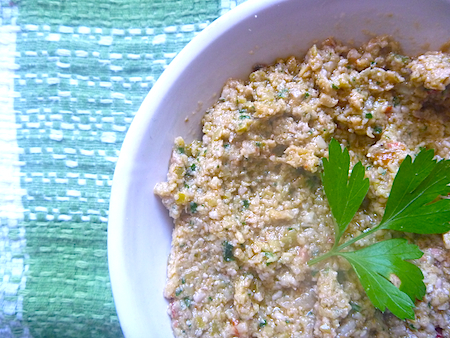 I’ve been making this green olive tapenade for years now. The original recipe comes from Moosewood New Classics, which is a great book for family friendly vegetarian food. This tapenade never fails to impress but it is dead easy to make and can be pulled together in minutes. The original recipe calls for the walnuts to be toasted but I stopped doing that after I had too many disasters when I got distracted and burnt the nuts when toasting them in the oven. It’s just not worth the heartbreak. I also realized that it is highly unlikely that any of the high-end gourmet dips we pay so much money for would ever toast the nuts they put in their dips or pesto. If I need to toast nuts now I toast them in a cast iron pan so at least there in my sight at all times. You can toast the walnuts if you’re a stickler for details but I swear it won’t be any less delicious if you omit that tedious step. Since Maggie Beer single-handedly converted the foodies of Australia to verjuice, I pretty much always have some on hand as a pantry staple. I usually use verjuice instead of lemon juice in this tapenade. That eliminates yet another step of juicing the lemons. But if you don’t have any verjuice just use lemon juice. I also like to add some chilli flakes for that little bit of extra zing. 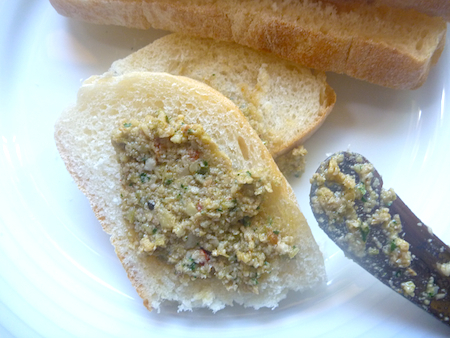 Green olive and artichoke tapenade. In the small bowl of a food processor, pulse artichoke hearts, walnuts, olives, garlic, parsley, chilli flakes and lemon zest until they are evenly chopped but not smooth. Scrape down the sides of the processor, then pour in olive oil and lemon juice or verjuice. Process until a cohesive but not too smooth paste.